There will be no doubt that love is in the air when your guests arrive and find these dazzling nestling-heart themed champagne flute candles. 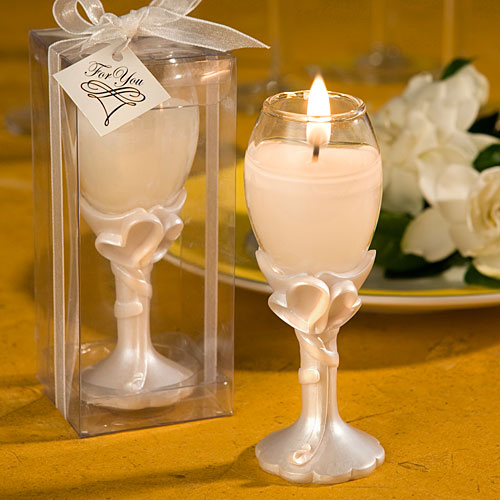 Each heart design favour measures 1.5" x 4" and resembles a classic champagne flute with a pearlized white poly resin base and stem enhanced with a stylized double heart design, supporting a clear glass top. Each has a poured white candle inside. Fitting as wedding favours, anniversary favours and so much more, each comes standing upright in a clear plastic box tied with a white organza ribbon and an attached diamond shaped "For You" tag.